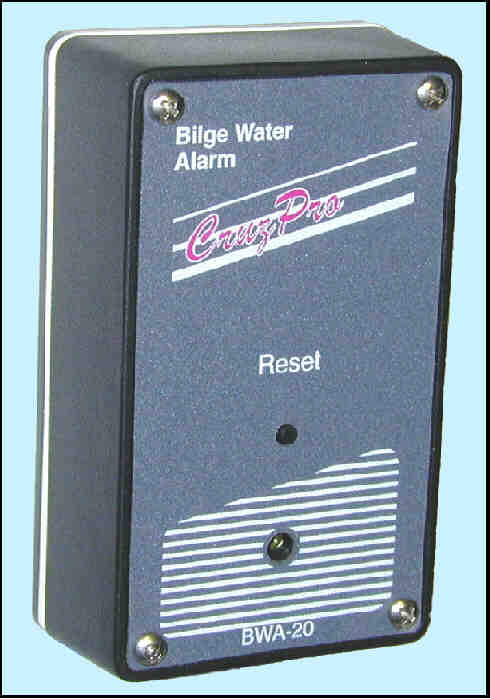 The BWA-20 Electronic Bilge Water Alarm uses modern electronics and a reliable solid state stainless steel water sensor to monitor your bilge for the presence of water. If the sensor detects water continuously for more than 15 seconds it sounds a built-in 85 dB audible alarm. The alarm will continue to sound as long as the sensor detects that water is continuously present in the bilge, or until the reset button is pressed. If the alarm is silenced by the use of the reset button, the BWA-20 will automatically arm itself again as soon as the water has subsided. A 15 second timer is started when the BWA-20 detects water. If contact is broken with the water for even a moment, the 15 second timer will reset and start over. This prevents false alarms due to a small quantity of water sloshing in the bilge due to boat motion. The BWA-20 operates from a standard 9V transistor radio battery for one year and will run for two years (or longer) from an alkaline 9V battery. The BWA-20 has a built-in low battery warning system that tells you if the battery needs changing by chirping briefly every few minutes. The rugged water sensor is constructed of ABS plastic, stainless steel water probes and is solid potted with epoxy resin. It is totally waterproof, will not jam or false alarm.